The actinomorphic flowers are arranged in corymbs of heads. The heads are subtended by a series of involucral bracts with slightly curved tips. The calyx is modified as a ring of hairs (pappus). There are both perfect and imperfect (carpellate) flowers in the heads. The perfect flowers are in the center and the imperfect flowers are arranged around the edge of the heads. The imperfect flowers have 3 pink fused petals and no stamens. The perfect flowers have a corolla with 5 fused, pink petals. There are 5 stamens. In both types of flowers the ovary is inferior with a single locule but only the imperfect flowers have functional ovules. The fruit is an achene at maturity that retains the modified calyx (pappus). Distribution in Bahamas/Globally: Pluchea rosea occurs in the northern and central Bahamas, North America and the entire Caribbean region. 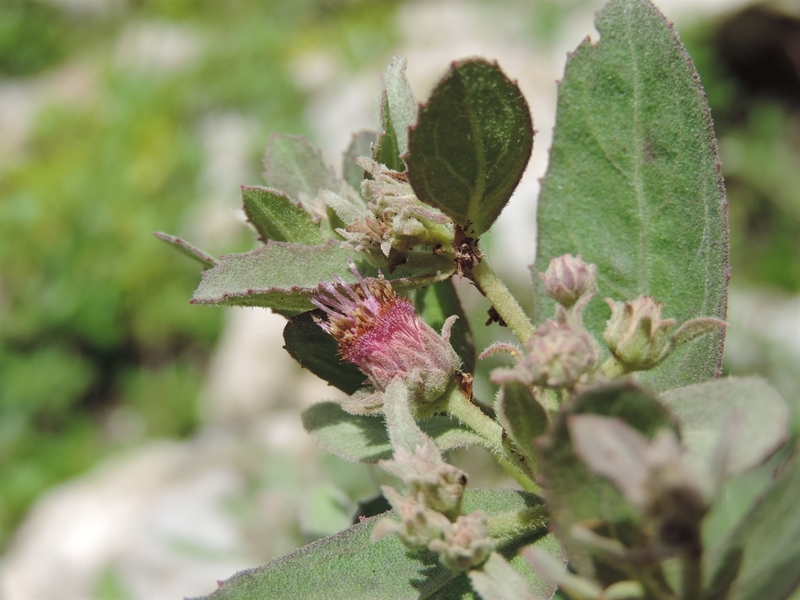 Medicinal/Cultural/Economic usage: Pluchea rosea is not used medicinally in the Bahamas.